Hora Loca of plena at St Regis Hotel Miami Beach with Black&Wine Productions! 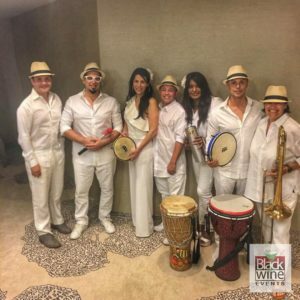 Fun night of plena with Gregori Laviosa’s Black & Wine Events at the St Regis Hotel Miami Beach for Hora Loca! ← Playing Hollywood’s 4th Annual Salsa Festival – tribute to women in salsa – was Hot! Playing Hollywood’s 4th Annual Salsa Festival – tribute to women in salsa – was Hot! America Teve show Happy Hour con Carlucho hosts Orquesta Calle Sol last night! Salsa! At Miami’s Major League Baseball Marlins Park – Dodgers Game! Calle Ocho Festival 2016 with Rumba Kings! @jc_country hey, thanks! :) Cheers!